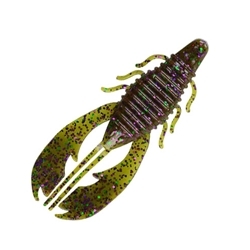 Berkley's Havoc Craw Fatty has bigger ribs and a wider body for increased action and maximum disturbance in the water. Bobby Lane designed this thinner design in the plastic body which results in flawless hook-ups. This bait is a great multipurpose bait, you can flip it, pitch it, punch it, Texas & Carolina rig it, or use it as a jig trailer.